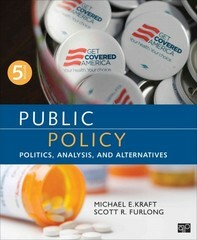 Public Policy; Politics, Analysis, and Alternatives 5 Edition The authors want students to understand how and why policy analysis is used to assess policy alternatives--not only to question the assumptions of policy analysts, but to recognize how analysis is used in support of political arguments. To encourage critical and creative thinking on issues ranging from the federal deficit to the Affordable Care Act to gun control, the authors introduce and fully integrate an evaluative approach to policy. Public Policy begins with a concise review of institutions, policy actors, and major theoretical models. The authors then discuss the nature of policy analysis and its practice, and show students how to employ evaluative criteria in six substantive policy areas. Public Policy arms students with analytic tools they need to understand that the motivations of policy actors--both within and outside of government--influence a complex, yet comprehensible, policy agenda.